5. Area covered in sky: 598 sq. deg. 11. Other interesting objects: IC 59 and 63, NGC 281, 7635 and 7789. 13. 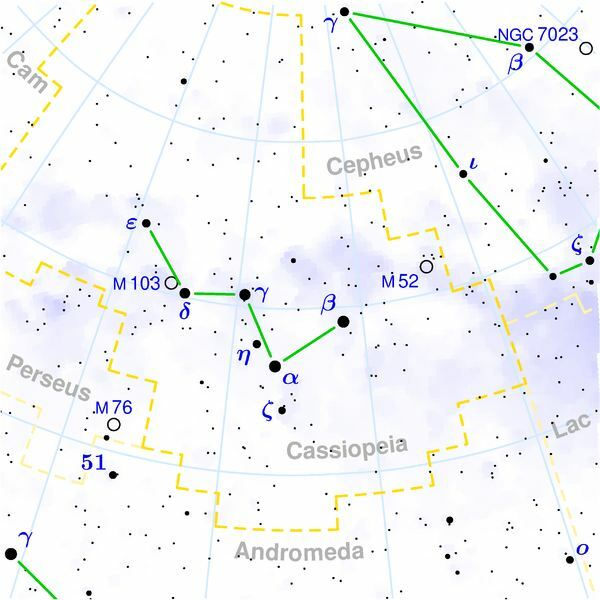 Mythology: Cassiopeia was the wife of Cepheus and the mother of Andromeda. Because she thought herself more beautiful than the daughters of Nereus, a god of the sea, she challenged the anger of the god Poseidon. To punish her, her daughter was chained to a rock on the coast as a sacrifice for a sea monster. Andromeda was saved from death by Perseus. To learn humility, Cassiopeia was banned to the sky hanging half of the time head downward. 1. The famous supernova SN1572, also known as Tycho’s star was observed in Cassiopeia. 2. Gamma Cas, sometimes called Tsi , is an unstable blue subgiant. It throws off shells of gas at unpredictable intervals. So its brightness varies between 2nd mag and 3rd mag. 3. The star HD 17156 is known to have a transiting planet orbiting it. 4. Rho Cas is one of the most luminous stars in the Milkyway with a luminosity 550,000 times that of the Sun. 5. Cas A is the remnant of a massive star that exploded in a supernova 300 years ago. NASA’s Chandra X-ray telescope has captured various images of this supernova. The expansion shell of the star has a temperature of 50 million degrees Fahrenheit.